Small turtle with an oval carapace that is keeled and almost as wide as it is long and olive-gray in color. The front flippers have one claw each. Adults weigh 85 - 100 pounds / 24 to 30 inches in length. Hatchlings: 1 ½ inches long. Age at maturity range from 7 to 15 years. Nest in Florida from April through August. Diet consists of crabs and other shellfish. 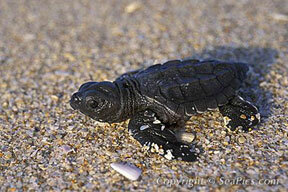 Kemp's Ridley are named for the fisherman who first described them in Florida. Juvenile and subadult Kemp Ridleys are widely distributed throughout the coastal waters of the U.S. from Texas to Maine. 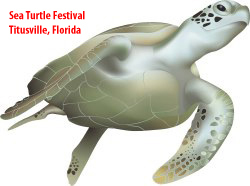 When temperatures begin to drop, the turtles in northern regions head south to Florida. Females often nest 3 times per season. 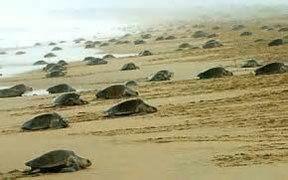 Nesting females come ashore in groups known as "arribada" or mass nesting. A 1947 amateur film showed 40,000 females nesting on a beach in Mexico in a single day. With a worldwide female nesting population estimated at just 2,500; Kemp's Ridley are the rarest and most endangered of the sea turtles with extinction in the foreseeable future. One danger to the population of Kemp's is being trapped in ship trawls. One mechanism used to protect turtles from fishing nets is the turtle excluder device (TED). It is attached to the shrimp trawl as a grid of bars with an opening at the top or bottom, fitted into the neck. 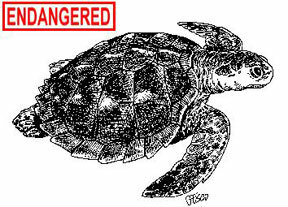 TED allows small animals to slip through the bars and be caught while larger animals, such as sea turtles, strike the bars and are ejected avoiding possible drowning. The crawl pattern for a kemps has alternating comma-shaped flipper marks without a well-defined tail drag. This track shows the kemps crawling up the beach to the nest site and returning to the ocean.